A community meeting to revisit the site plan and also discuss additional improvements to Mills Park will be held on Wednesday, May 3 from 7 to 8:30 p.m. at Pleasant Home/Mills Park, 217 S. Home Ave.
During the outdoor tennis season in the Chicagoland area, you'll most likely find Luka and Mirka Bagos at the clay courts of the Oak Park Tennis Center off Harlem Avenue. The success of the St. Luke 8th grade girls basketball team speaks for itself. The Bearcats rolled to an 18-0 record this season, highlighted by a 33-26 win against Ascension in the championship game of the Classic League. A commonly held belief at any level of sports is if a team's best athlete is the hardest worker, everybody else will fall in line. What about if that kind of work ethic exists among five athletes? That's the luxury St. Luke cross country head coach Jim Morrissey was afforded this fall with eighth grade runners Angelique Lorenzo, Jillian Johnson, Aimee Morrissey and the Vaccaro sisters, Elana and Ava. If St. Luke cross country runners Anthony Vazquez and Jake Wiktor are looking for some friendly competition on the race course, they can always look for each other. That's exactly what they did during the IESA (Illinois Elementary School Association) sectional meet at Busse Woods in Elk Grove Village on Saturday, Oct. 10. 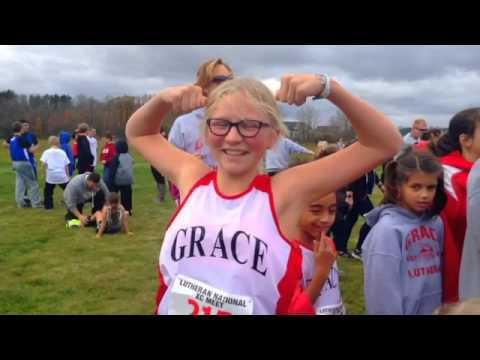 The Grace Lutheran cross country program has made their mark not only on the local middle school running scene but nationally as well. The Mascot finished 8th in the girls and 11th in the boys races at the Lutheran Cross Country Middle School National Championshipsheld at Concordia University in Mequon, Wis. on October 24.